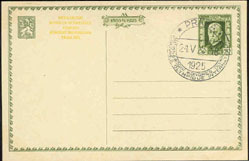 5369 ENT CZECHOSLOVAKIA (1925) International Olympic Congress 50 Haleru postal card with matching commemorative cancellation for the International Olympic Congress in Prague. Hard to find! 4785 ENT CZECHOSLOVAKIA (1952) Woman in native garb*. Score of folk song*. 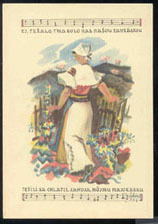 Postal card (N) with color illustration of woman with flowers, by Czech painter Martin Benka, and portion of folk song with music. Unusual and scarce! 4786 ENT CZECHOSLOVAKIA (1952) Woman in native garb*. Score of folk song*. 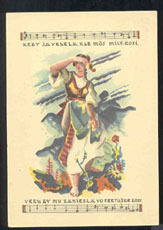 Postal card (N) with color illustration of barefoot woman peering off into distance, by Czech painter Martin Benka, and portion of folk song with music. Unusual and scarce!